If you need a new roof, it is helpful to know the basic components. A new roof consists not just of the type of roof covering you choose, but the entire structure. There are many different styles of new roofing, and is largely dependent on local climate and the preferred style of your region. The basic components of a new roof can be separated into two categories: the supporting structure, and the outer weatherproof layer. The horizontal beam at the top of a roof, to which the upper ends of the rafters are attached. It forms the apex of a roof's triangle. 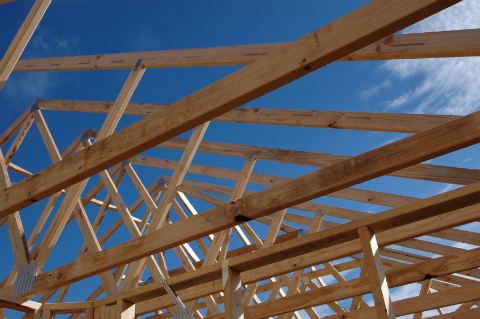 Rafters are sloped beams that run from the ridge board to the eaves. They support the roof deck and all outer materials, and resist the downward force of gravity. Ceiling joists run parallel to the ridge board, across the rafters. They act as ties for the rafters, protecting against the outward thrust caused by the weight of all materials. An eave is the lower edge of a roof. Eaves normally project past the walls of the building, in order to keep water away from the walls. The waterproof and insulating layer laid on top of the roof deck. It can be made of many materials such as asphalt shingles, metal panels, and slate or clay tiles. The horizontal band that caps the edges of rafters. Usually made of wood or metal, it is visible from the ground. The gutters are normally attached to the fascia. A narrow channel attached to the edge of a roof, in order to collect and divert rainwater away from a buildings foundation. Beyond the physical structure, there are many other topics to become familiar with if you need a new roof. Read up on how much new roofing costs, how to buy a new roof and how to obtain quotes for a new roof.